THE STATE OF New Jersey, located on the east coast of the UNITED STATES between NEW YORK, PENNSYLVANIA, and DELAWARE, is home to hundreds of flora and fauna. The landscape of the state is comprised of pine forests and flatlands in the interior, swampy meadowlands in the north and the dry Pinelands in central and southern portions of the state. 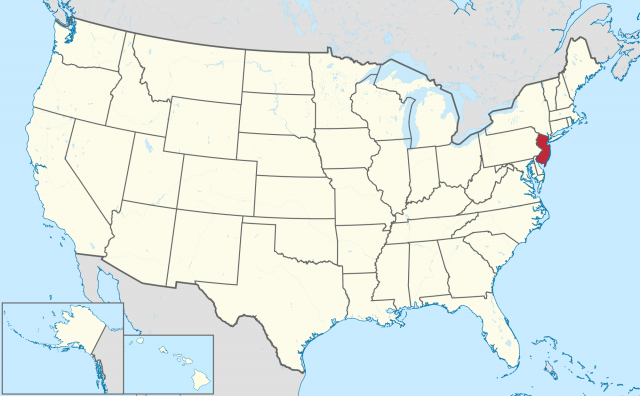 New Jersey is located in between the northern and southern region of the United States. The state has a moderate climate, hundreds of miles of coastline, and distinct geographic regions, and it is home to over 500 kinds of animals such as frogs, deer, raccoons, and dolphins. In 1664, the land in New Jersey was included in a grant Charles II gave to his brother James, the Duke of York. James gave the land to two of his friends, Lord Berkeley and Sir George Carteret. Carteret was formerly the governor of the island of Jersey off the coast of England. Carteret sent his relative Philip Carteret to lead a group of emigrants to his land, and they created a settlement at Elizabethtown. Settlers began to arrive from New England and they founded Newark. Carteret formed a government in which religious liberty was granted to all Englishman and more began to arrive. In 1676, the province was divided into East Jersey and West Jersey. These two Jerseys ultimately became united and were placed under the governorship of New York and New England. In 1702, New Jersey became a royal province united with New York. This lasted until 1738, when the two colonies were finally separated. By 1760, 75,000 people occupied the colony of New Jersey. Almost all were farmers from English descent. As New Jersey, along with the 12 other American colonies, began to protest certain British measures, a rebellion against British rule seemed inevitable. The 13 colonies worked together to stage a joint resistance, and by April 1775, the war for independence was under way. For the next eight years, the colonists in New Jersey witnessed a number of battles on their soil, including fights in Trenton and Monmouth. George Washington’s Continental Army camped out in Morristown in the winter of 1779–80 and marched up and down the colony throughout the war. After an astounding victory against the British in 1783, representatives from New Jersey and the newly freed colonies convened four years later in Philadelphia, Pennsylvania, for the Constitutional Convention. On December 18, 1787, New Jersey ratified the constitution and became the third state in the United States. Between 1790 and 1820, as the United States grew, New Jersey seemed to develop at an extremely slow pace. The population rose from 95,000 to 227,500 between this period, and its agriculturally based economy lagged behind as the United States entered the INDUSTRIAL REVOLUTION. During the Civil War, thousands of troops from New Jersey fought for the Union. After the war, New Jersey grew at an incredible rate: 1,883,669 people inhabited the state in 1900, and factories increased by 230 percent. Railroads were developed, and Jersey City became a major transportation center. Immigrants began to populate the larger cities, and the face of the state underwent a major transition. After World War II, the American people began to settle into suburbs of major cities. Towns in New Jersey became major suburbs for New York City and Philadelphia. Between 1950 and 1960, the state’s population dramatically rose by 1.2 million. Farm owners were selling their land to developers, and homes were built at a staggering rate. New Jersey also became home to a multitude of research centers. Ethnic groups in the larger cities such as Newark were also changing. Over 130,000 African Americans moved into Newark between 1950 and 1970. Many of these citizens faced unemployment and extremely difficult living conditions. In July 1967, the city of Newark seemed to explode as rioting and burning broke out: 23 people were killed and $10 million of property was destroyed. Around 23,000 private jobs were lost between 1967 and 1972. Into the 2000s, revitalization projects are occurring in Newark, Jersey City, and Camden, and the shoreline (Atlantic City and its casinos) remains a vacation spot for many.